Organizations are the schools, businesses, and other entities with which your school has some association. An organization might be a business, school, church, non-profit, governmental entity, or other. Organizations are linked to people in your system as members. You can include orgs or members in mailing lists and other communications. You can accept donations from organizations. An organization can make a donation to your school. If it's not already in your system, you can use the donation details to create the new organization. When a student applies to have transfer courses accepted at your school, you can add the transfer institution as a new organization (with the type of school). You can add one manually (see below). Go to Admin > Add New Organization. Give the organization a name—at minimum, it needs a name! Fill in the other details—contact info, profile image, and tags. When you're ready, click Add Organization. After adding the organization, you'll be taken straight to its Profile > Activity Feed. 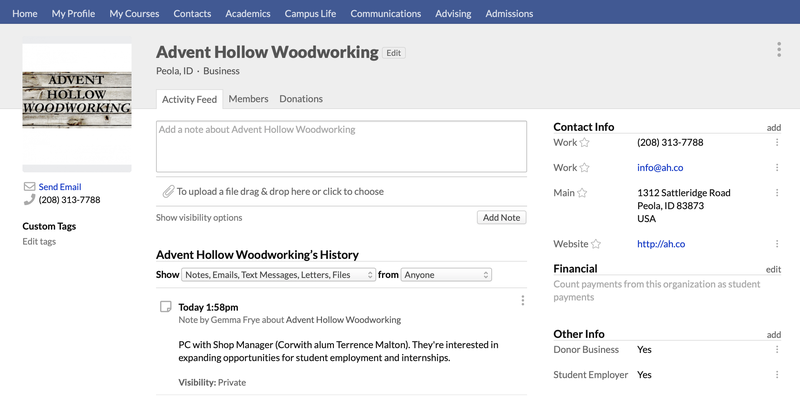 If you're at all familiar with personal profiles, then you already have the hang of what you can do with an organization's profile. The Activity Feed includes communications both with the organization and its members. Otherwise, it works much the same as the activity feed on a person's profile. The feed is also where you can view and update contact information and any custom organization fields you have (under Other Info). Type a name to search for the person. Select how the person is related to the org—as a student (for schools), member, or via employment. Enter a title, if any, and a timeframe for the member's involvement in the org. The Donations view works just like it does on a person's Profile > Financial > Donations view. Should you need to delete an organization, click the menu button and select Delete... Doing so will not affect any of the organization's members.